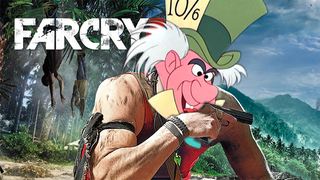 Far Cry 3 is an excellent game. It's mechanics make it one of those neat games that had thousands of little surprises to throw at you, each one as delightful as the last. It's a game that revels in logical chaos. It's a fun game, but something about the game really REALLY bugged me. It wan't the odd glitch or wonky platforming, it was the constant barrage of Alice in Wonderland references. What, you don't remember the scene where Alice sets the Cheshire Cat ablaze with a flamethrower? Er...sorry...What I meant to say was "not much as it turns out." Jason Brody's violent romp through a tropical island full of people and animals that want to kill him barely resembles Carroll's tale of a young girl's travels through an unimaginable world.The reference seems as much a throwaway as the Werewolf Bar Mitzvah reference. Have I ever told you the definition of "inanity"? But the game just keeps throwing reference after reference at me trying to get me to believe that there is some deeper meaning at work here than just a few surface similarities when there JUST AREN'T. I'm dead serious, you could replace every Alice in Wonderland reference and quote with something from The Wizard of Oz and still get the same effect. The mushroom doctor could very well just have a field of marijuana with a stupid-looking scarecrow guarding it. The sign that reads "EAT ME" next to a bowl of hallucinogenic could just as easily read "THERE'S NO PLACE LIKE HOME." (The hallucinogenic triggers flashbacks, so I get double points on that one for making more sense than the game.) You could replace Hoyt with the Wicked Witch for all I care. The Matrix uses the Alice reference to show that our main character is entering a new and extremely different world that defies everything he knew before. The same goes for the cartoon Gargoyles. Same with the freakn' Resident Evil movies. Listen, if the Resident Evil movies are doing better symbolism than you, you need to sit down and have a good long think about your life. Are you referencing Jurassic Park just for a laugh? That's fine, no problem. Do you have a nod to Bioshock just because? I'll let that by, no problem. Are you using constant quoting Alice's Adventures in Wonderland to symbolize the journey of a young douche through a harsh unforgiving landscape occupied by pirates, murderers, natives, and a handful-a HANDFUL- of nutjobs? PROBLEM. I have a feeling you're no longer referencing Lewis Carroll. You're referencing Tim Burton and American McGee referencing Lewis Carroll. And not even that is working out in your favor. All the shame of a thousand Futterwakens upon you, sir. Look, when you reference something (especially if you shove it in our faces reputably) we're going to look for a meaning behind it. It's that meaning behind an object (basically any reference, image, sound, or word) that makes a symbol. If the symbol's meaning correlates with object, then congrats; you got a good symbol. If there no meaning then you don't really have a symbol, just a funny Ghostbusters reference or whatever. If the meaning is dissonant or doesn't fit with the object that well, then you got a weak or confusing symbol, or just no symbol at all. It makes you look like you don't know what you're referencing. It makes you look dumb. For instance, I could make a Mario game and just fill it to the brim with quotes from Shakespeare's Henry VII. Would that get people looking for some kind of meaning? Yeah, it would. Hooray! Symbolism! Does it make any sense? No. It makes me look like a huge tool who doesn't know what he's talking about. Send this princess away. I want a new one. Far Cry 3, you...YOU JUST GOT OUT-SYMBOLIZED BY A F**KING JOKE SCENE WITH A F**KING CROSS-DRESSING BEAR FROM A F**KING PARALLEL DIMENSION!!!!!! !